Congratulations to Budina, our week 3 ScreamFree Parenting drawing winner! We have two more copies to be given away this Tuesday, October 2nd and the following Tuesday, October 9! If you haven't yet entered, just follow the instructions on our original review. One entry is good for all ScreamFree drawings. Some years ago Jim and I volunteered for a river cleanup on the White River where it meanders through suburban and rural Indiana. It sounded like a fun way to spend a day canoing through the countryside. The White River is known locally for some very severe industrial fishkills, so no one really ever plans on going into it above the knee. Needless to say, our group ended up filling all the canoes as well as a large flat raft with everything from washing machines to spare tires to every kind of plastic implement ever made so everyone was walking their canoes down the river- and then the river got deeper and deeper (before we were near our final destination), so we all ended up swimming and pushing our barely-above-water garbage skiffs. If Ranger ever develops a third eye it won't be a real mystery. When we got on the school bus to head to a picnic, the conversation turned to one thing- plastic bags. How had so many of them ended up in the river? Was there a community-wide initiative to dam the river using only Wal-Mart bags? Every volunteer had spent just a little too much time disentangling their own share of thousands of plastic bags from our local flora and fauna. I've never looked at disposable plastic bags the same way since that river trip. We became dedicated users of cloth bags overnight. Sure, we still end up with a plastic bag every now and then, but we've substantially reduced our plastic bags consumed. We also try to reuse any plastic bags that make their way into our home. KNOT THE BAGS: For bags being stored bunch the bag at the base in one hand and pull it with your other hand toward the handles to push out all the air and make a rope. Then tie it once in the middle. This makes the bag less of an entrapment and choking hazard. It also keeps them more compact in storage. It's good to tie a knot even in bags you're throwing away because it keeps them from blowing into the local landscape. USE A BAG HOLDER: We used to use a cheap plastic one from IKEA that looked pretty bad when the bags eeked their way out the holes. My friend's mom saw fit to make us a very cute cloth one out of a tea towel and some ribbons similar to this. Lifehacker even has an extraordinarily utilitarian one made from a used plastic bottle. Amazon has some sleek steel and plastic ones. MANAGE TRASH STINK: We're notorious for letting take-out move into our fridge on a semi-permanent basis. It gets past the safe consumption zone and I forget to put it out on trash day. So we'll double bag it before putting it in the trash. If you don't live in a hot climate this can buy you a few stink free days. If it's hot here I double bag the hazardous waste and put it in back in the fridge until trash day. That way Ranger's cottage cheese doesn't have to smell like lo mein. 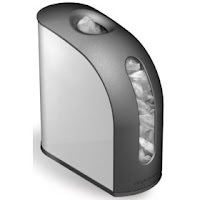 MANAGE DIAPER PAIL STINK: Ghastly diapers double bagged do less olfactory damage in even a floundering Diaper Champ. Stow a few in your car for wet clothes, dirty shoes, emergency barf bags, or use as vehicle trash bags. Shopping bags make great liners for small trash cans. Clean plastic shopping bags are usually welcome donations at thrift stores and food banks. I strongly recommend cloth bags or durable, reusable plastic bags (IKEA and Trader Joes both sell great ones) for every family. Yes, it takes a little bit of time to get used to taking them to the store, but it's well worth the effort. For each ton of plastic bags not used 11 barrels of oil are conserved. That doesn't sound like much but each plastic bag used ALSO consumes fossil fuels in transportation, storage costs for manufacturers and retailers, more fossil fuels in transportation to landfills, and landfill space. Often these bags are only used once. Plastic bag recycling is problematic. The EPA estimates that only 1% of America's plastic bags were recycled in 2000. I learned from someone in the recycling industry that a lot of the store shopping bag bins end up contaminated and can't be recycled. It turns out that there are subtle differences in the plastics (including dyes) that make it impossible to recycle say a Target (white with red), a Wal-Mart (blue with multi-color), and a Best Buy bag (yellow with black) in the same lot. Long story short- most of those grocery store plastic recycling barrels are there to ease consumers' consciouses rather than actually recycle. The contents of those plastic bag collection barrels frequently end up in landfills. To make your own cloth bags (and some friends), see the tutorials at morsbag.com (social guerrilla bagging) or craftster.org. Pirates, cowpokes, insects, trout, and animal crackers! This week Z Recommends (one of my favorite blogs) is having a 5 x 7 Music Week (5 reviews for 7 days). They have loads of good music, interviews with musicians, and guest reviews from other bloggers (including me). Stop by, enjoy a musical interlude and find some new tunes for your family collection. How Do You Spell Two? N.O. With any burgeoning toddler, there's a heavy level of frustration for toddlers and parents alike. The word "No!" sometimes seems to be the only word in the vocabulary (and I'm not talking about the toddlers here). Their higher energy levels seem to draw directly from our own declining ones. Everything is a crisis. from falling off the rolling chair he's not supposed to be on to intentionally dropping a lovey out of the crib during naptime. It's easy to be a little chagrined. Well, I don't have a hack for this. But my friend IndyWriter wrote so insightfully yesterday on life with her 2 year-old daughter that I just had to share her post. Our youngest electronics fanatic loves buttons and switches. It makes me crazy on days when he gets a hold of any remote or "works on" any set of control buttons. Some friends had this same problem with their young geek who flitted around their tv controls like a moth to flame. As the tv must remain in its present location, they had to find a something to prevent their wee technophile from the on/off and channel buttons. With pure hacker ingenuity they broke the prongs off two electric outlet covers and duct taped them over the raised buttons. Voila! Mini-AV geek foiled! Congratulations to Allison from Wisconsin on winning the second copy of ScreamFree Parenting. We have 3 more copies to give away through the next 3 Tuesdays! If you haven't already entered, Register here (only one entry is needed to participate in all the drawings). Judy at Goodyblog just pointed out that a critical children's health care funding program is set to expire on September 30th if Congress doesn't intervene. The State Children's Health Insurance Program (SCHIP) helps working families who don't make enough to pay for private health insurance but make too much to qualify for Medicaid. What this means is that if the legislation expires, many more families will have to abandon regular preventative health care and only seek medical care in emergency situations and settings. Now everyone who has spent time in an e-room or has been admitted to the hospital, can tell you that even the aspirin are extraordinarily expensive. So the expiration of this legislation will end up costing everyone more in the long run. And more importantly it will unnecessarily endanger the health of infants and children nationwide. Medical debt already ranks as a leading cause of bankruptcy in America (to understand this situation more fully please read Elizabeth Warren's findings on who goes bankrupt in Maxed Out), so making preventative health care less accessible to children and infants can only damage our national and state economies. Please take a brief moment today to let your national representatives know this needs to be addressed before it expires on SEPT 30th. If you blog, please post something to encourage widespread public support of this critical legislation. Last month, I was honored to attend an adoption shower for friends adopting a daughter from China. My connection to the adopting mom is through one of my dearest friends (who hosted the event). As I'm reasonably food-obsessed, I volunteered to bring muffins. On Craftster I had seen photos of similarly decorated international adoption cupcakes, so I couldn't resist trying my hand at making mini-flags. If you have some Avery 5160 labels and want to print your own you can download MS word formatted sheet for 30 US flags and a MS Word formatted sheet for 30 Chinese flags. [These files are zipped, but should otherwise be standard Word format. If you're an Open Office user, email me for odt files- Google base is rejecting them at the moment.] Or you can grab the US flag and Chinese flag jpg image files and use them with the software or label of your choice. We're a sometimes overwhelmingly enthusiastic group for anyone- especially a small child new to the country. There are items the family could use for the trip to China and immediately after their return to the US. The adopting family applied to adopt two years ago. Our whole community is SO EXCITED for them and wanted to do something fun and encouraging to help pass the time while they're waiting for their daughter to come home. The shower offered the opportunity for people who will be in different areas of this child's life to meet each other before the baby arrives. It saved the adoptive mother hours on the phone explaining where they are in the adoption process to everyone who attended. She had a very receptive audience to talk about all that has happened through the adoption process. She worked to find a non-infant, non-maternity themed shower invitation. After a lot of hunting, she found a beautiful dragonfly stationary which she customized for the event. As the mom of honor teaches Sunday School for elementary schoolers, the hostess helped arrange for the Sunday School kiddos to make their own congratulations and welcome cards. After the gifts were opened, they were laid out on a table so people could see the various things. This is really nice with intergenerational showers as many people like to see what current baby toys and gear look like. The shower didn't have games. Instead the hostess decorated with potted flowers and put a prize notification under a few of the seats. The person seated in the lucky chairs got to take flowers home. She set all the furniture and decorations up the night before the shower with a friend. On the day of the shower she and two friends prepared and served the food. Her casseroles were so good that I got all three recipes to share. They're all great to prepare the night before, refrigerate, and cook the next day. These are delicious examples of Midwestern church supper fare. Combine cheese, eggs, evaporated milk, salt, and pepper in a large bowl. Add potatoes, onion, and remaining ingredients. Pour mixture into greased 9 x 13 pan. Bake at 350 degrees for 1 hour. Grease 9 x 13 dish. Put in bread. Then add meat & cheese. Combine soup, milk, & well-beaten eggs. Pour over ingredients in dish. Refrigerate overnight. Bake at 350 degrees for 1 hour. Grease 9 x 13 dish. Put in bread. Crumble sausage over bread. In large bowl, combine remaining ingredients & pour into dish. Bake at 350 degrees covered with foil for the first 30 minutes. Remove cover and bake 30 more minutes without foil. Congratulations to Caitlin from Virginia- the winner of our first of five ScreamFree Parenting book giveaways. If you haven't already entered, enter today. We'll be drawing another winner every Tuesday (September 18, 25, and October 2)! If you've noticed a posting slowdown in the past week, it's not your imagination. This weekend we hosted a brunch and frozen food baby shower for some great moms with new babies due in the next few weeks. I've written about food showers before (twice), so I won't go into repetitive detail. Store-bought frozen foods for the dads (think college-grade frozen pizza and microwavable breakfast sandwiches). BRUNCH & BUFFET. With a couple good breakfast casseroles, strata, or quiches it was so much simpler logistically than the tea shower. The two casseroles I served were Gayle's amazing recipes from an adoption shower she hosted last month. Watermelon basket- completely freehanded it took maybe 5 minutes. I suspect with about 10 more minutes of preparation it could have even been symmetrical. Very few disposable goods were used. We used my plates and glasses and the tables were dressed with cloth. The only disposable items used were the napkins (which were too adorable to pass up). In the tradition of my octogenarian friends from sewing, I used decorative items which were already around my home. This can have a very understated and gracious feel. Pre-portioning the frozen foods: Veronica had the inspired idea to split frozen breakfast foods into individual portions before freezing so the family would be able to heat only what they need at the moment. One of the best aspects of the shower was having my mom's help. She came early and washed some of my windows before the shower (see her in the picture?) in addition to helping get everything set up. During the shower, she entertained our baby guest (I don't know which of them had more fun) and she also packaged all the leftover food and did the dishes! Wow! I cannot tell you how surprised I was to walk into a clear kitchen. One of my mom's friends hires high schoolers from her neighborhood as assistants whenever she hosts a shower. Assistance with serving allows a host more time to enjoy their guests and party. Helping a friend who is hosting a shower can be a great gift of your time. Jim and my dad also helped a lot! Jim worked on the front porch, driveway, and yard while Dad took Ranger for pancakes at IHOP. Then Jim and Ranger headed to Kentucky for a fall party at Aunt Mo's leisure farm (complete with hayrides, boats, fishing, and chili made in a 55 gallon drum stirred with a canoe paddle). Veronica made awesome individual cakes (chocolate and white with raspberry filling) for everyone at the party. She was also awesome and came early to help, so she made a lovely arrangement of fruit with some assorted dishes from my cabinet (I especially love the blueberries in the spiral olive plate nesting among the grapes). With 8 individual cake plates, it was easy for the table to look cluttered, so we stole a technique from the pros and tiered them. I used an assortment of cans from my pantry to get a variety of heights: big pear cans for the highest tier, condensed milk half-cans for the second tier, and a water chestnut can for the lowest tier. I covered the cans with a runner. My cream table cloth was visually boring, so I dressed it up with an improvised runner (a floral twin bed sheet folded in half). If you don't love ironing tablecloths, but want a fresh look, put them in a warm dryer for a few minutes and then immediately place on the table. (I should have done this with the runner too). Jim recommends this excellent mnemonic for arranging a place setting (thanks, Parent Hacks!). Use interesting plates and have someone artistic lay out the food. My favorite plates are 1970s green and brown acquired at antique malls and thrift shops. I tend to stick to white serving dishes, so I can easily add new pieces. Don't be afraid to pull out the fine china- when else are you going to use it? Borrow big or infrequently needed items. Maggie loaned me her gorgeous punch bowl and cups. They were beautiful. With all the help and generosity of spirit, the whole day left me feeling incredibly fortunate to have such great family and friends. Maybe (with their help) this hostess is getting a little less awkward. Do you have any good baby shower/party tips or freezable recipes to share? When I opened a warehouse club box of Huggies Natural Care Wipes, I noticed something was awry. One small bag was flanked by two much taller ones. Aha! Was corporate greed betting that tired parents wouldn't notice that if one of the three 240 count bags was a little light on wipes? Well, no. At the next available nap time I sat down and counted the small bag of wipes... Wipes are terrifically time consuming to count if you're going to refold them so they'll fit in the dispenser (behavior expected for anyone cheap enough to count wipes in the first place). AND THE WIPE COUNT WAS PERFECT. Completely as advertised. Maybe the last bag on the roll is smaller and the machines just stuff them in tighter? Any ideas? Maybe they're just messing with my mind. Either way Huggies measures up- which is great because their Natural Care wipes are the best. Consider this a slow news day. As always, this is the independent opinion of Baby Toolkit (babytoolkit.blogspot.com). I picked up a couple of PBS new program preview DVDs at BlogHer, and one really stands out as a favorite: Word World. Word World seems to be designed for early literacy (3 to 5), but 2 year old Ranger laughs each time letters transform into a word. The large colorful characters appeal to Ranger, even if Jim finds them all slightly insect-like with their letter segmentation. Many of the objects and characters in Word World are composed of the letters that assemble their name. So profiles of the canine reveal D-O-G (left side) or its mirror image (right side). It has upbeat music and stories with lots of humor. You can check out Word World online and find local broadcast times through PBS Kids' Word World site. During one of the warmest, most expansive months of my pregnancy with Ranger, I found myself in Oakbrook, IL- home of a great REI store. When I walked into the store I only needed a watch with lap timers for swimming, but I desperately wanted to buy something exuding family fitness. Just a couple days before I had been diagnosed with insulin-dependent gestational diabetes, and I wanted to prove that I was actually more concerned about my health than the little bottle of insulin in my hotel room seemed to suggest. In retrospect, my motives were completely silly but, in all honesty, buying this specific piece of gear did make me feel better. REI is a great place to test a backpack carrier. They have a stuffed bear in the child carriers area that is weighted to match a small infant. Definitely test babypacks with the bear in them. It's a very different feel from an empty pack. Sure, the bear is sometimes off-balance, but this is realistic as your child will at times work to be off-balance as well. 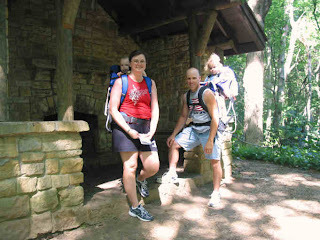 We bought a Kelty Pathfinder (for aroung $200), and it's a great carrier for older infants and toddlers. I'd definitely categorize this type of high-end pack as luxury gear rather than necessary gear. Maybe it's the hellish heat and West Nile mosquitoes of Southern Indiana talking, but we tend to use this more when traveling than at home. That doesn't prevent the carrier from getting a lot of use. Quite a few of our friends (pictured here- nope, that's not us!) 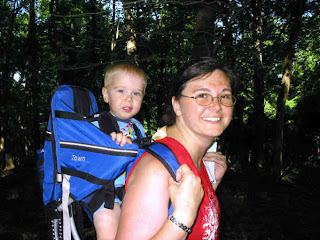 have been stomping around in the woods with them on hikes or letterboxing adventures. For a lot of families, this would be a good item to borrow from friends/lend to friends unless you'll be using it every weekend. This summer our packs have kept up with the schedules of two pretty active families in addition to our own, less motivated, schedule. This type of frame backpack carrier requires an infant with ample experience sitting up unsupported and holding up their head despite jangling. We put Ranger in shortly after he could sit and hold his head up and the spring of our steps bounced his head in ways that looked uncomfortable and made him cry. When we tried again a few weeks later, he loved the bounce and the perspective. In ideal weather, the Pathfinder is my favorite pack. Its chest strap makes for a fabulous fit for the long haul. But the weather isn't often ideal here, and that's where the Tour model comes in handy. The ventilated back panel is a great feature on hot, humid days. The real "I love this gear" epiphany moment for Jim was at the West Side Nut Club Fall Festival (think German Octoberfest). The festival, at one time was hailed as the second largest free, outdoor, food festival (after Mardi Gras). While this festival occupies a geographically large area, it's crazily congested with people from lunchtime on. At night, it can be impossible to traverse with a stroller. The few people who bring strollers usually end up carrying their kids while their companions push the strollers because the kids either freak out at being completely walled in or the kids get banged into so often you wish your stroller was armored. A lot of parents use front carriers at the festival. This works really well for small, sleepy infants, but can be backbreaking when they're over 15 pounds and still keeps the baby's view pretty limited to body parts (yours if facing in and everyone else's if facing out). These views, coupled with noise, lines, and the distinctive smells of sauerkraut or funnel cakes, don't make for happy little travelers. So there we were, strolling along with Ranger perched comfortably high on Jim's back. No one's hands were occupied with baby nor gear (there's a diaperbag backpack on the Pathfinder for supplies). We were streamlined, so we could move casually through crowded places. We could get out our wallets to pay. We could carry food. But, it wasn't the sheer convenience of the pack that sold Jim fully, it was the envious looks of all the other dads carrying kids (with or without frontpacks) as their stroller prevented them from moving more than one or two feet in any direction without having to ask someone to let them through. In parent world, this type of pack is definitely trophy gear. It was fun watching parents point out the backpack to each other. And I think Ranger loved the attention too. He was effervescent as we walked around the festival well past his bedtime (though that may have been the lemon shake-ups). The Kelty's have a surprisingly long period of use with youngsters and they are made to last. The packs can hold a child up to 40 pounds (which is a still few pounds lighter than Jim's college packpack). *Baby Toolkit is the independent opinion of Jim and Adrienne Jones at babytoolkit.blogspot.com. We have received no materials or compensation of any kind from Kelty KIDS or their affiliates. We just love to write about baby gear. Laurel from Colorado was the winning entrant for our First Birthday Diaper Valet random drawing! Upon receiving notification of winning, she replied, "I can no longer say that I never win anything." Congratulations, Laurel! And thanks to everyone for reading Baby Tookit (and all the kind comments)! Have you entered our ScreamFree Parenting book giveaway? We'll be giving away one copy a week for the next 5 Tuesdays (courtesy of Broadway Books, a division of Random House, Inc.). In case you haven't already seen the article, last Saturday the New York Times wrote an article on the damage done to the Consumer Products Safety Commission in recent years. Read the article now if you haven't already done so. Government cutbacks have crippled public safety mechanisms while traditional safety watchdogs have been replaced with industry advocates. It's made our food and toys unsafe while we were all distracted with concerns over the safest car seat. We, people who care about children, are a bigger presence than any other. I for one, rank food and product safety as a top priority. How do we use our collective size to reinstate adequate public safety? I don't know, but I'm open to suggestion. The present toy recalls are probably only the tip of the iceberg. My friend just emailed that she's so bothered by the recalls that she's sticking with crafts and homemade toys until she sees some clearer sense of direction. Where do we go from here? Do we become the new watchdogs armed with a powerful Internet and sympathetic friends with fluoroscopes? What organizations (universities, hospitals, charities, think tanks, etc) do we advocate to step into the chasm that is being left by these cutbacks? If you are a reader who works for such an institution (or know someone who does) what do you need from parents to convince your organization to take up this cause? A lot of us have been wondering how these defective and dangerous products have made it into the country in the first place. Jim and I both assumed that there had to be random testing at ports as the FDA doesn't police import quality, but customs inspectors have no equipment and they don't have the authority to take suspicious goods for further testing. We couldn't be more wrong. The understaffed and underfunded inspectors that are present have their hands full looking out for their main charge; finding counterfeit products. Few people are watching this problem, and those who care are being systematically washed out or are burning out. Let's not die of poisoned toothpaste while wearing genuine Nike shoes. Let's do something about this. FOR a list of policitical people you can petition for change, persuade, or yell at please look up your Federal representatives at http://www.congress.org/congressorg/directory/congdir.tt or see all your state and Federal representatives using the zip code search engine at http://www.vote-smart.org/index.htm (I have no idea what this site's politics are, but it has a nice politician search). Thanks Jeremiah for the links. A couple weeks ago Broadway Books sent me an advance copy of ScreamFree Parenting: The Revolutionary Approach to Raising Your Kids by Keeping Your Cool for review. I hesitated to accept the book as parenting books have bothered me since they started appearing in my childhood home around the time of my own adolescence. My brother and I nicknamed one of the more ghastly tomes "Karate for Parents." Backstory: I grew up in a household with volatile tempers and lots of screaming (WAAAY more than average). My parents would shout over everything from minor inconveniences like misplaced items to serious disagreements and infractions so my brother and I followed suit. The parenting books always made things more tempestuous around the house. As a result, I really came to detest the whole self-help genre, especially parenting books. Years later, I lucked out and got the most amazing job as a university advisor. In those years, I found great mellow parenting role-models in my amazing colleagues. Daily, I saw the end product of 18 to 22 years of different parenting techniques. From observing my students, I learned which parenting styles brought out the best or worst in young people. It finally dawned on me that my own quick temper was self-indulgent and counter-productive. Jim (household Zen master) had known this for years, but was nice enough to wait for an epiphany on my part. In my head, I started writing new guidelines for how I think families should operate. There were a few things from that mental list in the promotional email for ScreamFree Parenting that made me pause and reconsider my immediate impulse to delete the message. The book seemed like it might address some critical parenting issues that most books overlook. So, I accepted a review copy with the caveat that I might never write about the book. But I liked it and found it worth discussing. ScreamFree Parenting, written by Hal Edward Runkel (a family therapist from the Atlanta area), is a parenting book that focuses more on the parent's reactions than on the child or individual behavior problems. It talks about familiar parenting issues like boundaries with fresh vision. I hate to excerpt or condense the book's ideas because my retelling will sound cliche at best. The book is not very long (which Jim and I consider a strength for this type of book). It starts off primarily as parenting philosophy (and I found myself thinking "So, the kids just get to do whatever they want?") but it gets into very effective parenting strategies (some of which I frequently used while working with college students) in the last third of the book. The book made me critically examine who I want to be as a parent and a person in helpful new ways. The author's approach is centrist and not tied to other ideologies (religion, etc. like so many other parenting books). It's approachable without resorting to buddy parenting, structured without rigidity, and peaceful for practitioners. The recommended techniques can help us foster greater independence, confidence, happiness, perspective, and integrity in ourselves (and resultantly our children). ScreamFree Parenting was released today in hardback and audiobook (there's also a 2005 paperback version which I have not read). Consider giving it a read or listen now even if you only have a newborn, it's good food for thought before you're in a conflict situation. For more information on the book's actual contents, please visit ScreamFree Living. As always, this review is the independent opinion of Baby Toolkit (babytoolkit.blogspot.com). We have received an advance copy of ScreamFree Parenting and 5 giveaway copies of the book from Broadway Books. We have received no other compensation from and have no other relationship with Broadway Books, Random House, Inc., or ScreamFree Living, Inc. or their affiliates.